Rep. Sabi Kumar has a message for students, parents, and teachers about the TNReady problems: Stop whining! I also ask a favor of you. 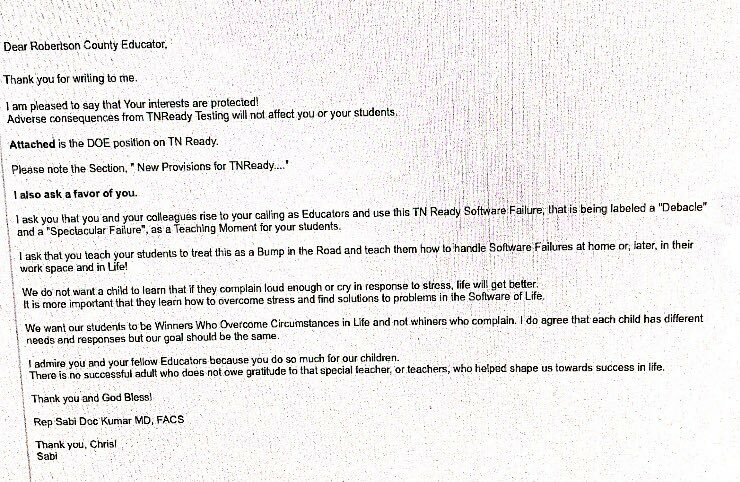 I ask that you and your colleagues rise to your calling as Educators and use this TN Ready Software Failure, that is being labeled a “Debacle” and a “Spectacular Failure”, as a Teaching Moment for your students. I ask that you teach your students to treat this as a Bump in the Road and teach them how to handle Software Failures at home, or later, in their work space and in Life! We do not want a child to learn that if they complain loud enough or cry in response to stress, life will get better. It is more important that they learn how to overcome stress and find solutions to problems in the Software of Life. We want our students to be Winners Who Overcome Circumstances in Life and not whiners who complain. I do agree that each child has different needs and responses but our goal should be the same. I admire you and your fellow Educators because you do so much for our children. There is no successful adult who does not owe gratitude to that special teacher, or teachers, who helped shape us towards success in life. Kumar speaks of teaching children to find solutions to problems while simultaneously refusing to hold the Tennessee Department of Education accountable. He fails to mention that the voters of Robertson County send him to Nashville to help find solutions. Instead, he allows a multi-million dollar, multi-year testing failure to continue and implores those pointing that out to stop whining. To students who have had schedules disrupted, test answers erased, and instructional time lost, Mr. Kumar says: stop complaining and don’t cry. One thing he says is true: So far, in spite of the outcry from teachers, parents, and students, life in schools during TNReady is not getting any better. The testing marches on, the window is extended, the problems continue and those responsible are not held accountable. Here’s how to contact Rep. Kumar.